Continuity and Handoff are two great features of OS X Yosemite and iOS 8 that allow an iPhone or iPad to ‘handoff’ an application, like a half-written email, over to the Mac to be completed in the Mac Mail app. It’s one of the major reasons for iOS and Mac users to upgrade to OS X Yosemite and it greatly improves productivity, but not all Macs support the feature. The Continuity Activation Tool changes that, it’s a third party utility that brings Handoff and Continuity support to some Macs that aren’t supposed to have the feature. There are a few Macs that can use this utility right out to the box to enable the Handoff feature, whereas some other Macs would require a hardware change to a newer Bluetooth card, making it somewhat impractical unless that was on your upgrade agenda anyway. The two Macs that will get the most use out of this immediately since they don’t require a hardware change are the 2011 MacBook Air line, and the 2011 Mac Mini line, and you’ll obviously need an iOS 8 device as well. 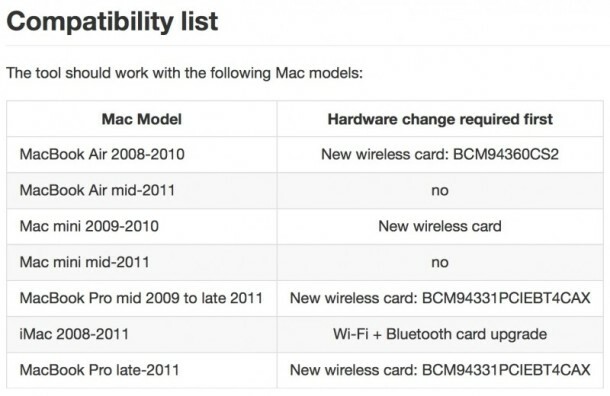 The full Mac compatibility list is below. The utility requires you to right-click and choose “Open” to get around the developer warning, then runs in the Terminal. Hit 1 to begin the activation process and follow the onscreen instructions. For what it’s worth, I had to run the tool twice to get the Handoff feature to actually show up in the System Preferences and then start working on a 2011 MacBook Air, but your experience may be different. This is completely unsupported by Apple, so you may want to back up your Mac before trying it out. With the feature now possible to enable, you’ll have to follow a few additional onscreen steps to get it all working, including enabling the feature in System Preferences on the Mac, being sure it’s on in iOS, then logging out and back into iCloud on the Mac again. You can test the feature by having someone call your iPhone, it will now ring on your Mac if it wasn’t before, and if you didn’t turn off the Mac ringing feature already (you probably soon will if you get a lot of calls). You can also open Safari or Mail app on the iPhone or iPad to trigger the current session handoff to the Mac with OS X yosemite. This is a great find from MacRumors, the tool was created by some of their enterprising forum members and works as advertised. And what about if i get an usb 4.0 bluetoth dongle? Any clues if that’s gonna work as well? Ok. I just got the answer reading the link with the source, where it says this is not compatible with usb dongles. Has anyone been able to get Handoff to actually work? I have a compatible Mac, and an iPhone 6, and it doesn’t work at all. Never. All settings on, triple-checked everything, never works. Reminds me of AirDrop or iCloud when first out, promise of a neat feature that doesn’t work at all. I’ve got a 5s and a 2012 rMBP and handoff works perfectly. Give Apple tech support a call and they’ll get it working. I have iPhone 5s and a 17″ Macbook Pro (2011, the last one produced) and it works completely perfectly just after upgrading everything. I had forgotten about it until my laptop and phone started ringing at the same time. The feature I was looking forward to the most is the SMS Relay and Calls on the Mac and those work on any Yosemite compatible machine. The ring gets annoying but I just wanted te caller ID and the ability to decline calls. It works well. I guess when 3rd party developers take advantage of Hand Off, it way be worth a hardware upgrade. I’d consider it if the wifi/Bluetooth cars were 802.11ac / 4.0 and under $50. Did the hack but stopped at the required signing out of iCloud then back in. Signing out deletes all the files off iCloud Drive and has issues with synced contacts. Is there another way to start the service without logging out of iCloud? Everything comes back when you sign back in. It did for me at least. Then again, I have another Mac on Yosemite plus an iPhone and iPad on iOS 8. However, my iPhone sees the mac safari, but not vice versa, maybe someone an idea ? Cool, it started to work suddenly, i guess, it took just some time. OMG you just passed on the can of worms macrumors opened up. Firstly, if this messes up your mac, you will need to reset the PRAM. Secondly, if you do this fix, and it works, and then later reset the PRAM, it will cause problems. This isn’t just a simple little thing your doing, it’s at your own risk. 1) the Macs that need a new BT card, this is not like swapping RAM, it is quite involved, in MacBooks it’s stuffed in by the display, requires removing the display, and most won’t want to do it. 2) any MBA/MBP older than 2011, the new AirPort card (BT/wifi), is not an exact fit, requires some handiwork. A: don’t think you can just buy a new BT card and swap it, not that easy. 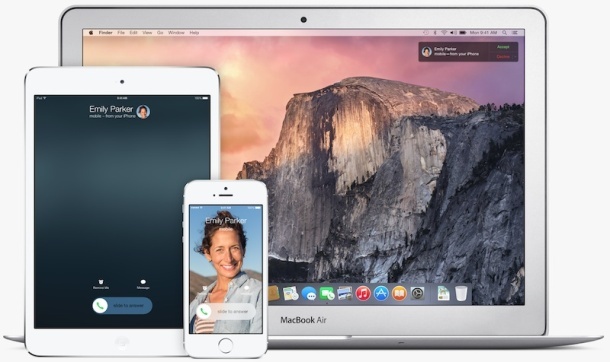 Just know that if you can install Yosemite on your Mac, you can do phone calls and SMS w/iOS 8.1 iPhones on any of those Macs…it’s the rest of the stuff it won’t do. Is there something to buy for this and where ? I have a Late 2011 MacBook Pro. I’ve recently upgraded to Yosemite and found out I didn’t have handoff or continuity. Thank you for posting this information. Using this and after replacing the AirPort/Bluetooth board, I was able to activate the missing features. Once again, thank you. I have a late 2009 model 27″ iMac and just upgraded to Yosemite. Surprisingly handoff seems to be working. I see regular texts and can make and receive phone calls from my Mac. I was under the impression that you needed a new(er) Mac with Bluetooth 4.0 (I don’t) and that you needed to have wi-fi on (works with wi-fi on or off). Yosemite update 10.10.1 has disabled my hand off hack on my 2011 MacBook air. Be slow and cautious to update! My iMac 2011 (mid) doesnt have BT 4.0, so I ordered the Broadcom BCM94360CD wifi/BT4.0 and a adapter for it. Did you work out a solution for your 2011 iMac? 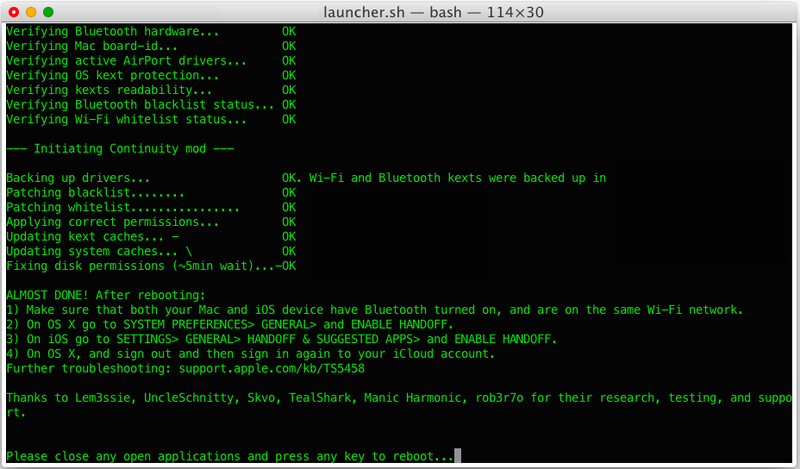 I also installed the just installed the BCM94360CD card – Wifi and bluetooth works but handoff is not. The activation tool does not recognize that there is BT 4.0 compatibility. I’m wondering if more needs to be done to enable the BT 4.0 capability of this board other than just pitting it in an adapter and shoving it in…. Has anyone else figured this out? I expect it will entail getting the USB D+/D- out? I actually bought the adapter that had this output that I can access but I have no clue how to actually take advantage of this. My experience is that not all these cards/with adapters are created equal. I ordered two (from a Chinese seller on eBay) with mini pcie adapter cards for my two mac pros. Tried both, with out success. The first gave me AC wifi but no BT, and the second neither wifi nor BT. I returned both for a refund. I have subsequently ordered another two from a different Chinese eBay seller. These new cards are over twice the price, but the guy assures me he tests all the cards he sells and they will work in my Mac Pro. so I await their arrival. I also have a 2011 27′ i7 3.4mHz iMac. The cards should fit it as well, but so far my research suggests I will need the usb connection option, with a USB connection on the mini pcie connected to a plug inserted into the old (and subsequently removed) BT motherboard port as well as a BT aerial extender as the Original BT aerial is too short to reach the BT aerial connection on the new wifi/BT card. If anyone can confirm this later assumption I would be grateful, as I have not ordered the gear for the iMac yet. Will this work on a 2012 Mini or will I be wasting my time? 2012 supports it anyway, why don’t you enable it without this? I do not have “Allow Handoff between this Mac and your iCloud devices” available to me. Is it possible to use Handoff between two *macs* rather than Mac and iPhone? Specifically with Safari tabs. I’m guessing no and it would have to be something like a hack one of he MacOS’s into simulating an iDevice and then converting whatever Cocoa/Swift object is used to connect to Mobile Safari into an equivalent object for MacOS Safari. This would be useful for people who have two laptops (an old one and newer) and might open a browser window on either. If there are such people other than me, that is. You can log in to Chrome and get that feature, and Safari offers iCloud Tabs to perform basically the same thing. Both will share a web browser session across devices using the same app. No Handoff necessary. this sounds like great news ! I have 2 older macs i would like to upgrade. 2. imac 27″ Late2009 with 3,0gGHz Dual Core. I was able to find the specification of the card for the MacBook Pro, but not for the imac. It just says new cards required. Can someone please tell me which exact card to use for my imac ? That would be great and really help me. Since this post is a little older i was wondering if you guys had a chance to see how reliable this upgrade is or if there are faults. Which speed do you receive after the upgrade via Wifi and BT 4? Thanks a lot for your reply and your shared experience on this upgrade. My Mac mini (Mid 2011) losing connectivity to BT mouse and keyboard when Continuity Activation tool installed. :( Seems the signal is intermitted when downloading/uploading something over WiFI, then mouse connectivity or keyboard connectivity is lost totally. When using WiFI sporadically just for Internet surfing it seems to be fine.